Select one or more files from the list. Program deletes all ID3 Tags artist, tile etc. including image files (cover art and other images) and lyrics. Note that ID3v2 tag may have more then one image file as you can see from the screenshot. Using this options is very useful specially if you want to be sure that no tags are left after removing. 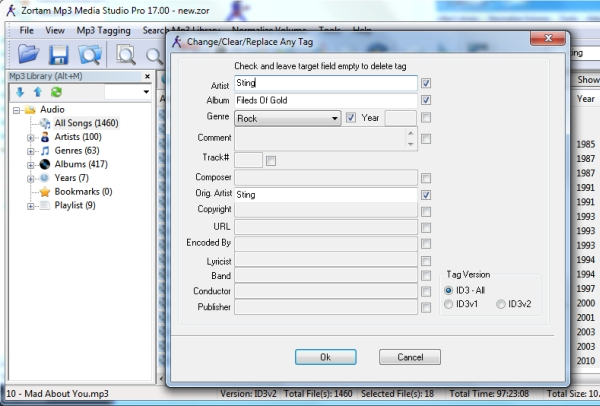 With this options you can remove or replace specific tag (artist, title, album etc) on one or multiple mp3 files. For example you can change(replace) existing album, genre, year etc. for one or several files making order in your Mp3 library. Select check boxes for tags that you want to change end enter new value for tag. In Edit ID3 Tags window you can also change any tag for specific file. If more then one file is selected program will change tags with the new string value that has been entered into edit box for specific tag. This entry was posted in How To and tagged Edit ID3 Tags, Edit Mp3 tags, remove mp3 tags on August 4, 2015 by Zortam Support.